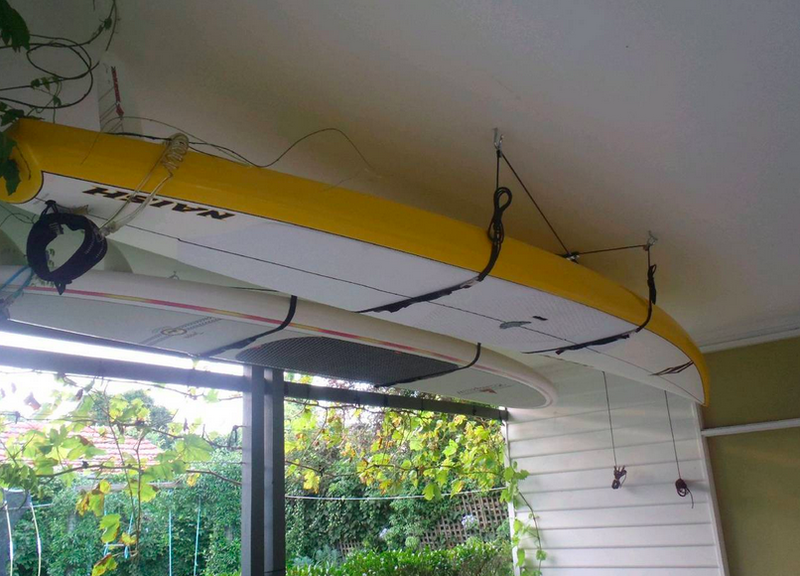 Here's a new option to put your overhead storage space to good use and protect your paddleboard from the dings it inevitably picks up sitting around in your garage. The SUP ceiling hoist is a premium quality 4-point lift kit for an easy way to store your paddleboard up and out of the way. The SUP Ceiling Hoist is in a league of its own when it comes to quality. The hoist kit comes with precision pulleys, stainless steel hardware, locking came, and high strength rope to ensure your SUP will stay safe. The SUP Ceiling Hoist will work on ceilings up to 10ft. The hoist is easily operated by one person and has a self-locking safety cleat that grips the rope instantly in case of accidental release. The 4-point system provides a stable and more secure way to store your board over a 2-point system. The hoist includes soft webbing straps that run underneath your board's hull to prevent any abrasions or distortion for long term storage.